Being in a surreal setting like a Greek Island can get very easy, very quickly. Beautiful views, great food, relaxing dinners, late night chats with guys named Socrates. Good times. But there are a few things that I really missed about what I called “the real world” while we were living the Greek life. Now that I’m home I’m not sure why I missed so many of them. Starbucks. I know. I know. I should have enjoyed the Greek Frappe’s and freddo espressos. And I did. I even had a few cups of REAL Greek coffee. That thick, chewy stuff that can keep you awake for a month. But by the time we got to Athens, I really felt like I needed a visit to Starbucks – if for nothing else, a sense of familiarity since I spend so much time there. Non-smoking restaurants. Wow do the Greeks smoke a lot. I have never been a fan of having to sit in a smoky bar or restaurant and thankfully we sat outdoors to eat for pretty much every meal, but still the amount of smoking that goes on in Greece is just astounding after getting used to the way things are in the U.S. I can’t believe that earlier in my career people smoked in their offices and I had to sit through it. Pizza. We were constantly in the mood for pizza probably because we couldn’t really find good pizza anywhere. The theory that Greece and Italy are so close, so surely there should be good pizza is not in play on an island that Greek families use mostly for summer enjoyment. We did find a great Italian place on Mykonos – a guy who came from Naples – and I wished I had eaten more. Or gotten take out for when we returned to the Andros. English. After a full year of Rosetta Stone I thought I was ready to immerse in the Greek language. That feeling went away on day one when I realized I hadn’t learned anything I could really use. I didn’t have much use for “the horse is white” in Greek. Just my luck, the next chapter in my lesson that I didn’t yet get to was “travel.” Why didn’t I look ahead? HGTV and the Food Network. I’m sort of stretching the truth here because I bought a slingbox before leaving and got to watch a little HGTV and Food channel in our time in Greece – but not the way I am used to at home (as a late night ritual). Watching Spongebob in Greek, however, was quite a lot of fun. Showers with doors. Really, why don’t the showers have doors? Our first hotel had a tiny shower with a shower curtain which was okay but the shower was kind of icky. Our second hotel (in Mykonos) had a bathtub with a shower but no curtain or door. Thus the floor got soaked. Back on Andros, the next shower was a huge beautiful old-fashioned tub. With no door or curtain. This room got flooded constantly. The last hotel in Athens had a sort of half door which was quite a treat but yes, the floor got quite wet. I was so happy when we got home and I was able to close the glass door to my shower. Who knew? Big fluffy towels – and washcloths. I will never complain about towels at a hotel in the US again. Well, I probably will but I shouldn’t. The towels were mostly just okay and we only had washcloths in one hotel. And at that, they were never replaced after the first day. Chocolate – Although we found some chocolate bars and ate quite a few of them, the choices were few and far between. I was dying for a plain Hershey Bar. Or a real chocolate chip cookie. Mexican food. See pizza above. But we never found Mexican. 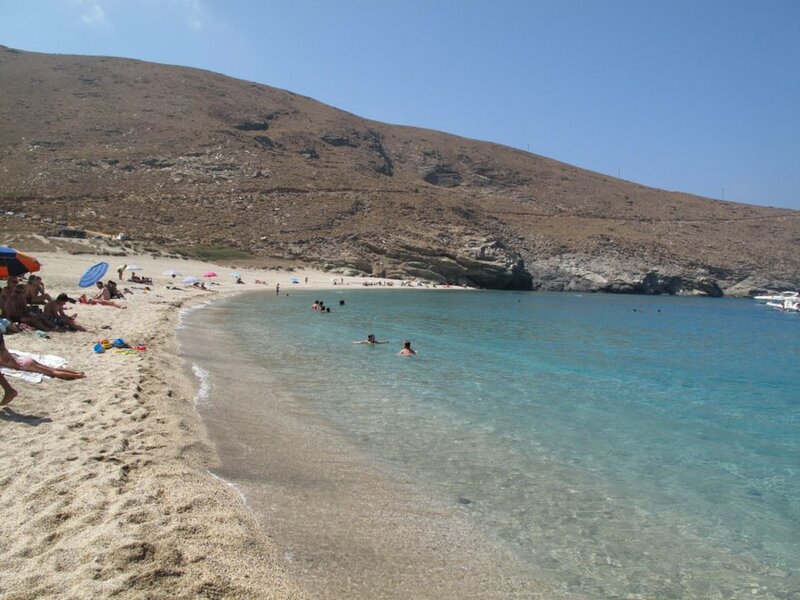 Maybe had we looked harder in Athens or on Mykonos we would have but definitely not on Andros. The Olympics. There I was at the home of the Olympics and I couldn’t understand a word of the coverage. We watched a bit but it wasn’t the same. The biggest irony was that on the day of the closing ceremonies, we went to the site of the ancient Olympic Stadium where it was rebuilt for the 1896 Games and took a tour. Sleep. What was the most fun about the trip – the lifestyle – also almost killed me. I’m not one of those “I don’t need sleep on vacation” people. I wish I were. But to be out every night until 2 or 3 a.m., then get up in the morning and get ready for the beach was great fun. At 5 p.m. the Greeks ‘take a rest’ or siesta but I’m not a napper so I always found myself as the sleepy one at the 11 p.m. dinner table. We’ve been home 2 weeks now and I still feel like I haven’t readjusted and still need some more sleep. All that being said, if you mailed me a ticket to Athens tomorrow, I’d be on my way. There’s something very nice about living in that surreal world and missing these mundane things in life. After a rousing start to keeping up on the blog while on vacation in Greece, I failed miserably after the first week. So it’s catch up time. Is it safe? Why yes it was. 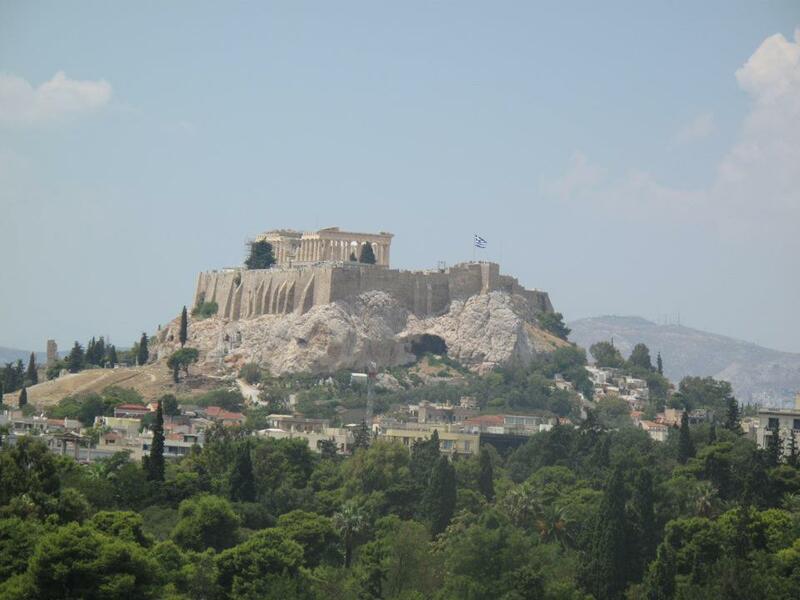 I never felt nervous or threatened on either of the islands or in center of Athens. Not even a little bit. Are you getting a great deal because of the economic problems. The simple answer to this is no. Just no. We paid as much (or more) as we did the previous year and airfare was much higher. I sort of thought the airfare would drop at some point to encourage people to go but it never happened. Are things still open or are all the businesses closed down. Pretty much everything was open for business. I did see a few stores shuttered that weren’t the prior year when we were in Athens. But on the islands, everything was pretty busy. We did notice that folks maybe weren’t necessarily eating out in the main town as much, but perhaps eating at home more and then heading out for drinks. But the mood was still quite festive every night. The one thing I can say, without a doubt, is that the current economic crisis is not the fault of the regular people of Greece. Just like the U.S. downturn, the problem lies (in my opinion) more in the hands of the politicians and the policy makers. Overall we consistently found hardworking regular people everywhere we went. The hospitality was top notch. From the hotel front desks to the housekeeping staff to the maintenance workers, everyone was exceedingly friendly and helpful and seemed genuinely happy to help. Our business was welcome. Restaurants were much the same story. The waiters and waitresses we encountered worked their butts off for whatever salary they made and smaller tips than American hospitality workers expect. We had been admonished by our Greek relatives for overtipping. “The rules are different here. It’s not like America.” But in my mind, good service is good service and it should be rewarded. The friends and relatives (and strangers) we spoke with about life in Greece given the crisis referred to it simply as “the crisis” but there was no sense of panic. People spoke of 10 percent pay cuts coupled with increased work hours with a kind of “what can you do” attitude. But they were on vacation and I didn’t want to press with annoying “but aren’t you worried” kinds of questions. The one part of the Greek economy that I wish we could mimic in the U.S. is the ferry system. While we rode ferries last year, we were more or less taken by the hand by our relatives. This year we rode four times on our own. And never have I seen a more efficient process than the loading and unloading of these monster ferries. They were on time. Did the quickest turnaround I have ever seen and were overall comfortable and a pleasure to ride. Contrast that with our return flight when we connected in Philadelphia and had seven – yes seven – time changes on our return flight all in the course of 45 minutes. It became comical as my cell phone rang each time to “alert” me of this change in schedule. I think USAirways should head to Greece and study the ferry system. Or just give up and go out of business. Bottom line for me. Don’t blame the Greek people. They are working as hard as ever, often for less money and putting in longer hours. They are each doing their part to keep the economy going.